**Beguiling pop experiments by one of Germany's most individual sonic pioneers and arranged by Michael Nyman. Includes 8-page booklet with extensive liner notes and archival photos** "German New Wave (Neue Deutsche Welle, NDW) reached its peak in 1983. In the public eye, Andreas Dorau was considered an important representative of NDW. But the sensitive artist had no desire to be thrown in the same basket as the terrible monstrosities of what had become a commercially exploited trend. Not that he felt any closer to the contemporary "underground" music of the day. "All far too dark. I didn't want to have anything more to do with music. Back then underground music wasn't allowed to be melodic. The dominant belief was: melody = stupid. And I wanted melodies." 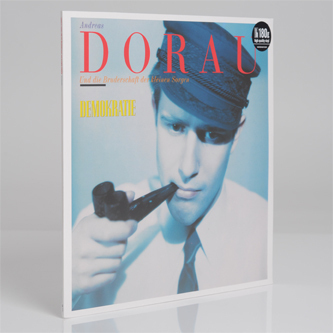 Dorau turned his back to the music business and moved to Munich and took his film studies seriously. Until one day Ata Tak founder Moritz Rrr called him up and asked Dorau if he fancied an informal exchange of ideas with artists from Berlin, no strings attached. He did fancy it and slowly but surely, he began to have fun again with music. At the same time, Dorau amassed a formidable record collection, largely from the 1960s. And so names like The Left Banke, Van Dyke Parks and The Move rotated on his record player. Such splendid music! The idea to make a new album dawned on him gradually. Dorau recorded, discarded material, wrote lyrics, overdubbed, arranged, discarded more material. So, he would rearrange, one track after another, so on and so forth. It was clearly a painstaking process. Still, a few songs fell into place. What he needed now was a producer. Off he went, to Birmingham to enlist his idol Roy Wood (The Move, ELO) as his producer. It could have been the beginning of a beautiful musical collaboration, if Wood had not happened to play an album by his favourite artist at that time. Dorau was back on the train to London before the first side of "No Jacket Required" had ended. Efforts to enlist Peter Thomas as producer also came to nothing and Dorau ultimately decided to take care of the job himself. David Cunningham (Flying Lizards) helped Dorau to enlist the English composer Michael Nyman as arranger on "Demokratie". Playing his songs to Nyman was a nerve-wracking experience for Dorau. After all, this was a serious musician. "Maybe it's crap", Dorau stammered. To which Nyman replied: "Oh no, it's Mozart." Music to his ears, so to speak. Why an arranger anyway? Dorau: "I always wanted music to sound different. Nyman is strongly influenced by Venetian music, in which instruments are played in untypical registers or scenarios. That was my aim for this album. I wanted to create pop music, as far as possible without guitars, simply different." Baroque pop / Roy Wood / Michael Nyman / melodies / no guitars, or thereabouts / electronics / Mayo Thompson also gets in on the act: an interesting mix? No, it's Mozart!"